Corey Crawford capped off his week in outstanding fashion with a shutout in his hometown of Montreal to help the Chicago Blackhawks to their fifth straight win and five points behind the Arizona Coyotes for the second wild card spot in the Western Conference standings. "[Crawford] was unbelievable," Blackhawks teammate Connor Murphy said to reporters after Saturday night's win. "A couple of those saves, even in tight, they had a rebound right in front of them and it seemed like he almost tracked it into his glove, it was that good. And some of those saves seemed impossible, but that's why we're happy to have him." Crawford made 24 saves to notch his and his team's third straight win in a 7-1 victory over the visiting Arizona Coyotes Monday. Blackhawks teammate Brendan Perlini had a big night by posting his first NHL hat trick against his former team. "We still know we're right there," Perlini spoke to grinding out wins to a potential playoff spot. "This year it's been like really in and out as far as a couple games go by and some teams are in it, then some teams are out of it. We know that we're still right there. As long as we keep putting good games together and wins together, we'll be around." "Crow" made 17 saves in a 5-4 road victory over the Toronto Maple Leafs at Scotiabank Arena Wednesday. With Chicago up 5-1 in part to a quick four-goal first opening frame, Crawford made 17 saves before departing after the second period due to illness. Backup netminder Collin Delia stepped in to fend off a rallying Maple Leafs team with 26 saves on 29 shots for the Blackhawks' fourth straight win. "It felt like an eternity, those final seconds felt like a half an hour," Delia said to reporters postgame. "I was sweating pretty heavily after the game. After skating pretty heavily this morning, it definitely felt like a full game that third period." Crawford cited a 24-hour bug and was up to make his next scheduled start at Bell Centre. Crawford was back in net Saturday night to tend the twine in his hometown of Montreal, Quebec. 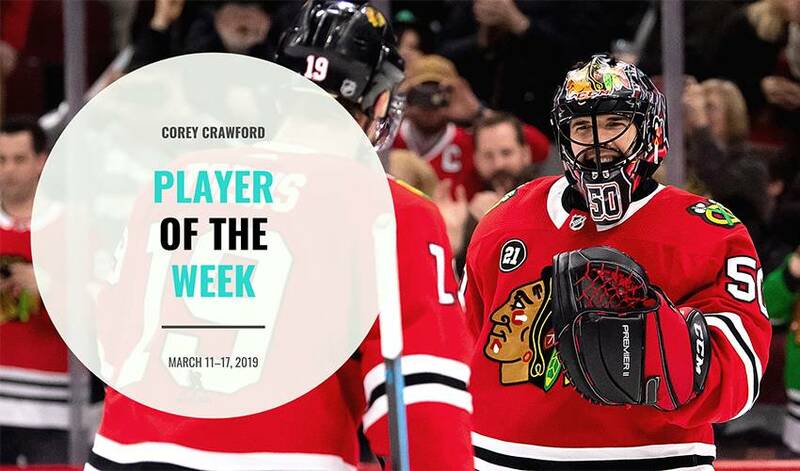 Questions of any lingering effects of illness were brushed aside as Crawford turned in his 25th NHL career shutout with a career-best 48 saves for a 2-0 win. His 48 saves tied a franchise record for the most by a Blackhawks goalie in a shutout (originally set by Dave Dryden, Feb. 15, 1969). Crawford traditionally plays well against his hometown team, and is now 9-2-2 with a pair of shutouts in 13 games against the Canadiens. He is 5-0-2 at Bell Centre, having never lost in regulation in Montreal. "He was excellent," Blackhawks head coach Jeremy Colliton spoke of his netminder's confidence postgame to reporters. "That's what he can do, and obviously it is in Montreal and he's pretty comfortable here, had a lot of success here, so he had a lot of confidence and it gives the team a lot of confidence that he's going to come through for us." The Blackhawks look to keep rolling on with the team back at it again Monday night when they host the Vancouver Canucks (8:30 p.m. ET).